Paul Draper can bend spoons with his mind, see through duct tape and read other people's thoughts. How did he develop super-human powers?! If you've got an embarrasing secret, you might want to bring a tin foil hat. Can you imagine being able to sense the thoughts and feelings of others? To find yourself inside their minds, aware of their innermost secrets? To see the sights they see and feel what they feel? Paul Draper can. He does all this and more in Mysteries of the Mind. Focusing on non-verbal communication, psychological suggestion and other natural powers, Paul has the uncanny ability to read the minds of strangers -- and to help audience members unlock their own ability to read the minds of others. In the show, Paul will amaze and entertain your guests by using his unique capacities to read thoughts, bend metal objects with his mind, and influence the actions of others. While Paul is a professed skeptic and a member of Americas premier skeptic society; his work is guaranteed to look like real psychic phenomena and to leave your guests wondering. Paul has appeared at Caesars Palace, HBO Comedy Fest, at The Magic Castle, on the History Channel, and at theaters across the US. 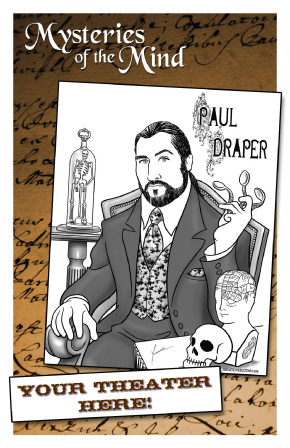 A true polymath, Paul Draper is a cultural anthropologist, mentalist, actor and magician. He lives in Las Vegas and Los Angeles, and tours regularly. Besides his work as a performer, Paul is in demand as a consultant to hospitals around the country with his popular "Helping Hospitals Heal" program. Learn more about Paul Draper's Mysteries of the Mind by clicking here.